While there’s always a lot of different exciting foodie events on for Good Food Month every year, for the most part they’re largely beyond my budget. As much as I would love to pay $150 for a Hats Off Dinner, I can’t justify the expense! I resign myself to enjoying the Let’s Do Lunch (read my review of The Bridge Room), Let’s Do Dessert and my favourite events – the budget-friendly, crowd-pleasing pop up markets. 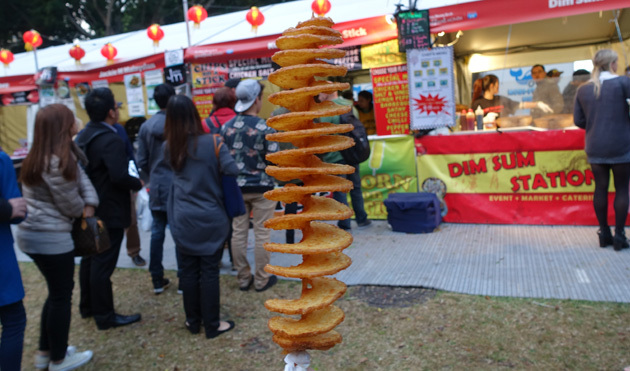 This year I attended Street Fest in Pyrmont Point Park, a gathering of Sydney’s food trucks, and of course, everyone’s perennial favourite – the Night Noodle Markets in Hyde Park. The photos in this entry are from a few different nights, so you’ll have to excuse the difference in quality – some are from an iPhone, others from a proper camera! 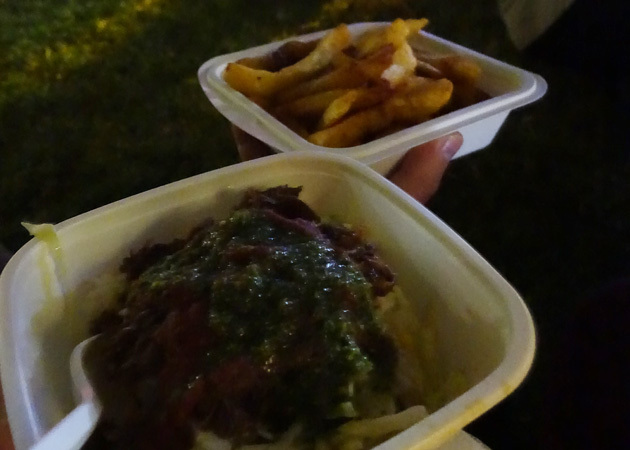 Street Fest was designed to appeal to a younger and more hipster crowd than the Night Noodle Markets. 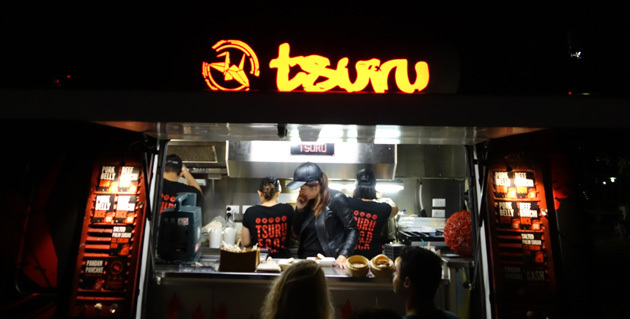 For one night only, Sydney’s best food trucks would converge on Pyrmont Point Park and DJs and dance groups would showcase the best in R’n’B and hip hop tunes and moves. In reality, it was a haphazard event with inadequate lighting that saw groups of young people stumble over each other in the dark and swear at the ridiculously long queues for food. K and I went with a group of friends, and we had quite a mixed experience. 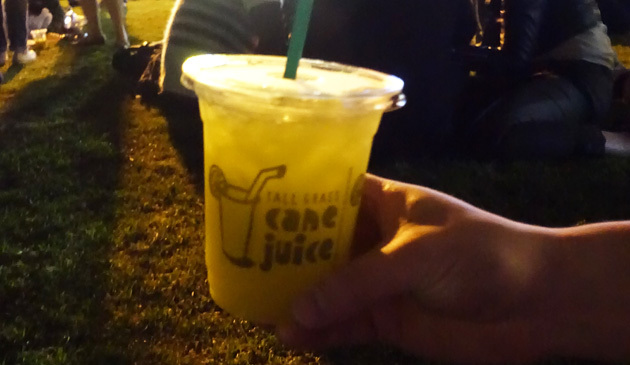 The sugar cane juice we bought from one stand was flavoured with lime juice, which helped to temper the sweetness of the sugar cane, making a very drinkable and more-ish juice. 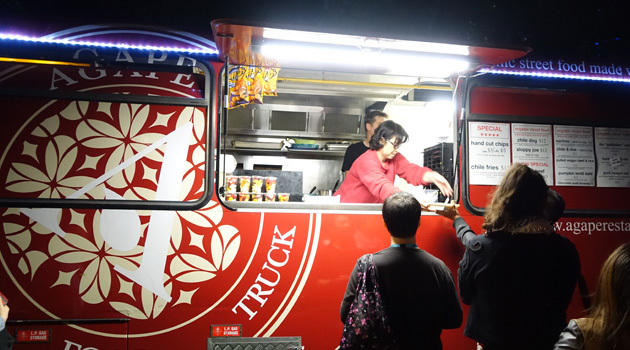 Our first food stop was Agape Organic Food Truck, an offshoot of Agape Organic Restaurant in Botany. I have to be honest – the main reason we chose this option was because the line was relatively short, and we couldn’t be bothered waiting longer somewhere more popular like Eat Art Truck. It turned out to be the right choice though, as the shorter line was more representative of the efficiency of the staff and their system, rather than any deficiencies in their food! Agape Food Truck use a buzzer system that notifies you when your order is ready, saving the staff from having to shout out order numbers and customers from lingering within a ten metre radius. We waited only about fifteen minutes until our buzzer went off and we collected our order. The pulled wagyu beef was deliciously tender, and was really set off nicely by the chimmichurri on top. The coleslaw was nice and crunchy, but unfortunately the rice was a bit gluggy. Overall, it wasn’t a bad meal! The hand-cut chips were a hit though, with all our friends helping themselves to a few chips while they waited in vain for their Eat Art Truck orders to come through (it took over an hour!). Our next stop was Cantina Movil for some Mexican food. Trying to keep my kilojoules down (ha! 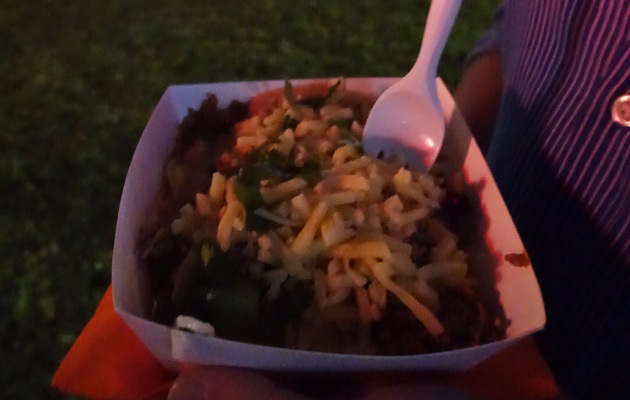 ), I chose a burrito in a bowl, rather than wrapped in the traditional style. This was particularly tasty – the chilli pork went really well with the chipotle mayonnaise, and had that extra special tang from a squeeze of citrus. Lining up at Tsuru, I had my eye on the pandan pancakes for dessert. Unfortunately, as I reached third in line, the staff removed the pancakes option from the board, with everyone groaning and complaining as a result. So close, and yet so far! I settled for a salted palm sugar ice-cream bun instead. I wasn’t quite sure what to expect – their savoury bun options used the white soft steamed Chinese-style bun, but obviously you can’t use a hot steamed bun with ice-cream. I was pleasantly surprised when I realised that they used a Hong Kong style cocktail bun as the bun. The coconut of the cocktail bun just went perfectly with the palm sugar ice-cream – a real hit! Unfortunately, while the concept of Street Fest was well-intentioned, the execution just didn’t work. One example that stuck in my mind was the fact that while food trucks were banned from selling drinks (all drinks had to be purchased from the bar on site), they didn’t take that into account with their meal prices. My friend tried to order one of Eat Art Truck‘s meals advertised on their regular menu on the side of the van – burger, chips and a drink for $15. They still charged him $15 though they wouldn’t serve him a drink, saying that he had to buy the drink separately by lining up at the bar. Surely, the owners of Eat Art Truck should have taken the “no beverage sales” policy into account, and reduced the usual meal cost accordingly? It’s only a little thing, but it’s that kind of negative experience that sticks in your mind unfortunately! Our next stop a few days later was the Night Noodle Markets. The weather forecast was grim, which meant that everyone stayed home, leaving the markets dead quiet. Deciding to take our chances, we showed up anyway and enjoyed the bliss of having no queues. And the rain held off! Win win. 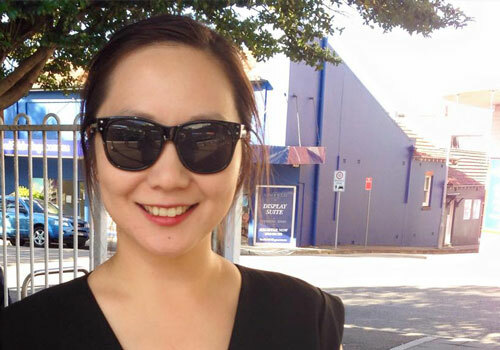 There on a double date with a former colleague and her husband, we wandered around looking at all the stalls at the markets this year. Agreeing that dessert was the ideal way to start our evening, I ordered sticky rice with mango from Span Thai. 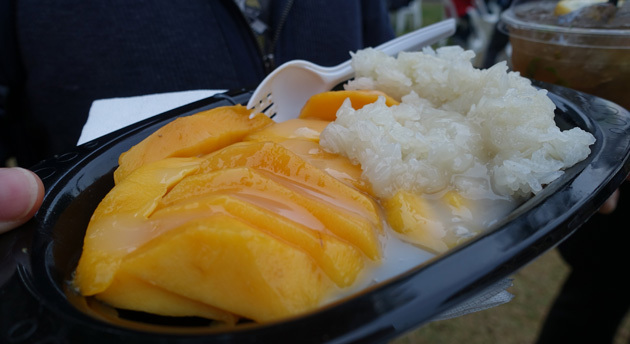 It came with a warm coconut sauce that really enhances the strong sweet tropical flavours of the just-in-season fresh mango, and helped make the slightly-dry sticky rice more palatable. 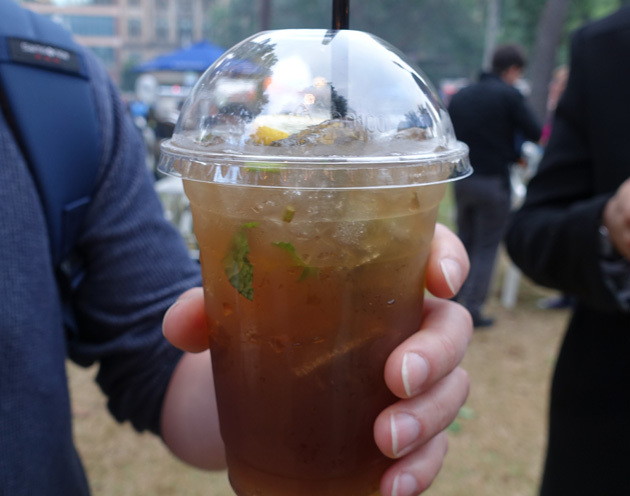 K was also complaining of thirst at this point, so I also got a lemon ice tea for us to share from the same stall. Lightly flavoured with ginger and mint, the tea was very refreshing and definitely hit the spot. Moving along, one of the few stalls with a queue in front of it on this gloomy overcast evening was “Korean Chips on a Stick”. It’s a simple concept, and one we had while we were in Korea earlier this year – though ours was a bit fancier as it also had a sausage in the middle! I’d have to be honest though – this was probably a tastier version, as the chips was crispy on the outside though still soft in the inside. We chose to have the “special spice mix” on our chips on a stick, which consisted of chicken salt, salt and vinegar, lemon pepper, barbecue, satay, cheese, chilli, pepper and salt. It was an amazing combination of both chilli burn and salty mouth-puckering. As much as I loved the tender mouth-watering goodness of the pork belly bao, I have to say the standout for me was probably the tofu bao. I really wasn’t expecting much, so to be surprised with crispy-skinned soft tofu with a subtle yet effective accompaniment of peanuts and soy…it blew my mind. 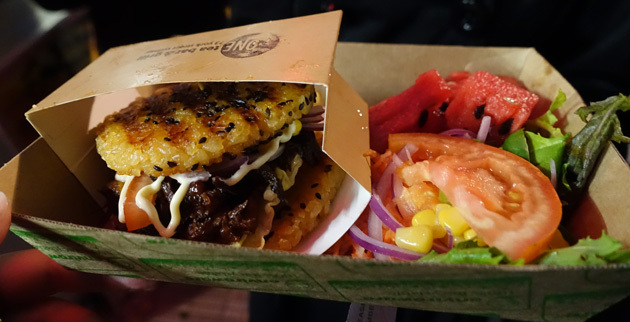 Last year’s fad of the Ramen Burger drew both positive and negative comments – I even created my own slider version. Rice burgers are this year’s fad offering, which reminds me of the rice burger created by Dani Venn on Masterchef back in 2011. This version was…interesting. If you don’t go into it expecting a bun that tastes like a bread roll, you’ll probably quite enjoy it – the pork rib is marinated really well in a BBQ sauce, and the chewier rice burger actually goes well with the tender meat as it lends some texture to each mouthful. Served with a small side salad and some watermelon to cleanse the palate, it’s actually a really good value meal. The last main of the night that K and I shared was the mee goreng from May’s Laksa House. Notably, not a laksa. 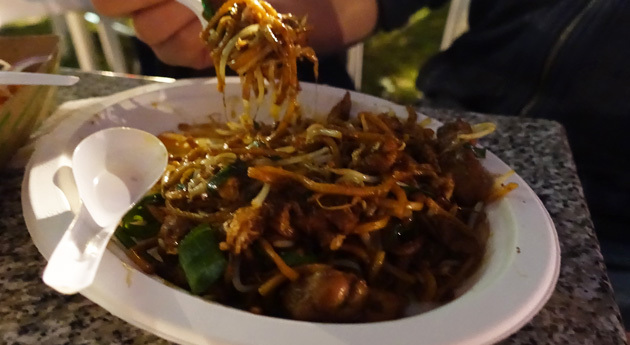 It’s a decent mee goreng though with plenty of “wok hei”, though I would personally have preferred a touch more chilli and spice – I always feel like Malaysian food is a bit lacking if you don’t finish with a burning mouth! I think K would have liked to try the Phuc Khing Tasty as he loves coffee gelato, but as I’m more of a peanut girl, I convinced him to share the Street Hawker with me instead. It was very very more-ish (the lime and chocolate brownie in particular), and Gelato Messina continues to impress. 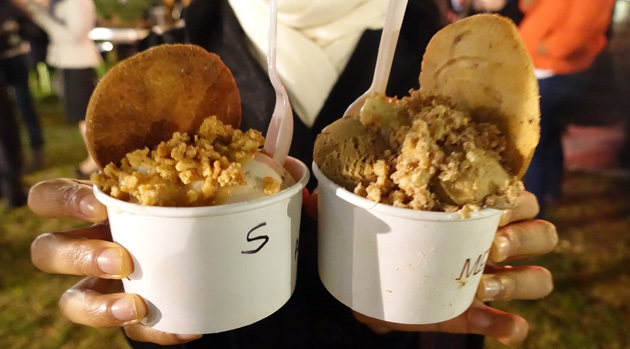 I would go back before the markets end this year to try their other two custom desserts! The following night, we returned to the Noodle Markets on a whim – K’s colleagues wanted to play ping pong at the Nova Ping Pong tent, so we went along as well. It was much busier on our second visit, as the weather forecast was good and we found ourselves battling the crowds and queues. Succumbing to our grumbling stomachs and reluctant to queue for half an hour or more, we satiated our initial hunger pangs at the stall with the shortest queue, run by The Star casino. We were apprehensive at what we would get, but soon realised that the short line wasn’t due to terrible food, but merely to extreme efficiency on the part of the staff. It was less than five minutes from the point that we started queuing to when we actually received our Angus Beef Salad. The Vietnamese style warm salad of beef and vermicelli noodles was very heavy on the lemongrass – almost too much so. However, it did the job and kept us satiated while we lined up for Jackie M‘s Malaysian cuisine. The staff were churning out serve after serve of CKT, rotis, and curries but almost couldn’t keep up with demand – there were just that many people waiting for their serve of some of the best Malaysian food in Sydney! We ordered a chicken CKT (with a spoonful of sambal sauce), and also ordered a serve of otak-otak (grilled spicy fishcake in banana leaf) and pulut panggang (grilled sticky rice in banana leaf with spicy dried shrimp and coconut), unpictured. It was the first time I’d ever tried pulut panggang which I found a really interesting mix of savoury and near-sweet. The otak-otak was as good as ever (better than my usual serve at Sambal in North Ryde) and the CKT full of wok hei. In the darkness of Hyde Park, K’s colleague accidentally had the spoonful of sambal sauce in one full mouthful, rather than mixing it through his CKT first…he definitely regretted that decision! 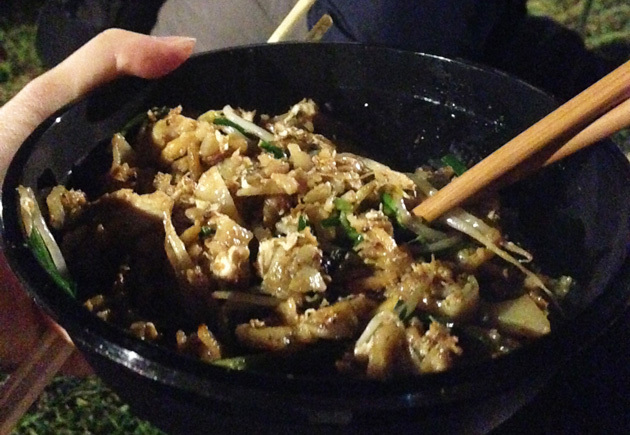 All in all, the Night Noodle Markets are always an enjoyable experience – more so when you don’t have to queue for over half an hour at each stall! It’s always interesting to see what new stalls and new dishes will make an appearance each year – and which will stick around. Personally, I’m hoping that Wonderbao will decide to open up a branch in Sydney, so I can have that delicious tofu bao more often! Man those Gua Baos look delicious, I need to get me some of them!! I think the insane queues always put me off going to these kinds of events but I’m glad I at least got to try wonderbao! We got a custard bao instead of the tofu but now I wish I’d tried the tofu one instead! I’m heading to the noodle markets tomorrow with my husband so hopefully the lines aren’t too insane. I’ll be sure to pack some snacks just in case though!